A girl is only as good as her equipment. Amiright? I attended a seminar put on by the Victoria Quilters Guild and the guest star was Jenny Doan from Missouri Star Quilt Company. She said that she’s been asked many times about the best machine to buy and I loved her response, “Buy the best machine you can afford and one where there is a certified technician nearby.” This is the best advice. Price usually drives my machine purchases, which is why my first look at a new machine is always a Brother. There are certified Brother technicians in nearby San Antonio. Brother and BabyLock are cousins, but Brother machines are far less expensive (I’m not sure why). But I’ve had Brother machines for years and they provide excellent results without breaking the bank. After my first Brother machine, I stuck with them because I can’t count how many different presser feet I have and I want them to universally change between my machines. My first was the Brother CS6000i and my 2nd was the Brother SQ9050. Both are pretty great feather-weight machines and I put the CS6000i down in our house at the Texas Gulf Coast. I recently Craig’s listed my Brother SQ9050 and bought the Brother PC-420. Oh. Be. Still. My. Heart. The Auto-Threader. The Knee Lift. The Thread Cutter! Wow, wow, and wow! I’m having a serious love fest with this machine. For the price, you can’t beat this dynamo. I absolutely adore her. Right out of the box, she performs like an absolute dream. I do a lot of machine quilt piecing and use some pretty expensive threads. The last thing I want to do is waste 10-12 inches of thread by not using the auto-thread cutter. And the knee lift? Ahhh! I just giggle at not having to reach behind the machine to maneuver fabric any longer. 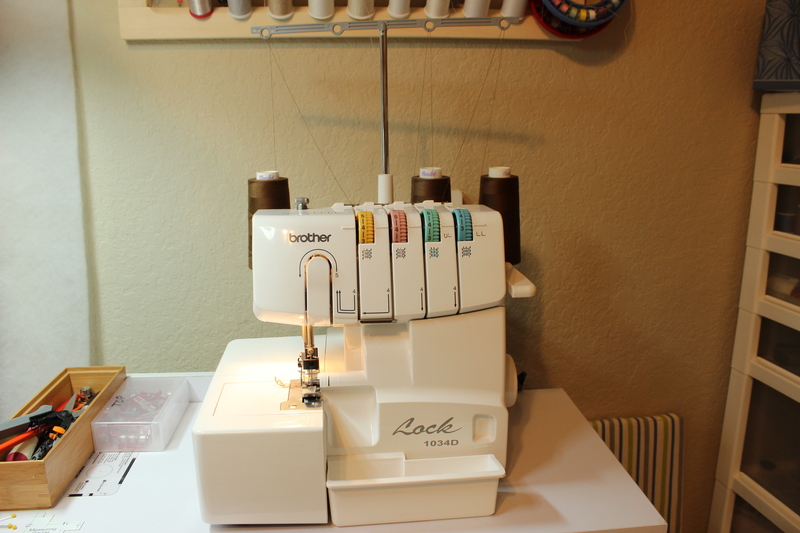 My serger is the Brother 1034D Lock. This is my 2nd serger and my first was not a Brother (but I wasn’t seriously power tooling with thread then). Let’s just say I’ve never wanted to throw a machine out the window more times than when I owned my first serger. Fortunately, I didn’t let the machine deter me and I bought the Brother 1034. Again, a love fest. Easy to thread, easy to sew, easy, easy, easy. I use this for more than just finishing garment seams. One of my favorite tricks is to serge the unfinished edges of yardage and then wash it so it gets all kinds of shrinking out of its system. This takes minutes and saves hours and hours of wasted time by sewing something that shrinks in the first wash.
Embroidery. I have a serious fascination with machine embroidery because of the instant gratification factor that comes with it. In less than a day, I can have an in-the-hoop project (or two) done and ready to give as gifts. AND…I love to embroider quilting projects! My first embroidery-only machine was the Brother PE-770 and I loved her so. As my embroidery skills and pattern designs expanded, I looked for a different machine that could go beyond the 5″ x 7″ hoop limitations of the PE 770. I lurked Craig’s List and found the Baby Lock Ellegante 2, brand new, for less than half the original sales price. It is one of the last machines Baby Lock put out circa 2006 with a screen that’s not the size of a 7-10″ Android tablet. 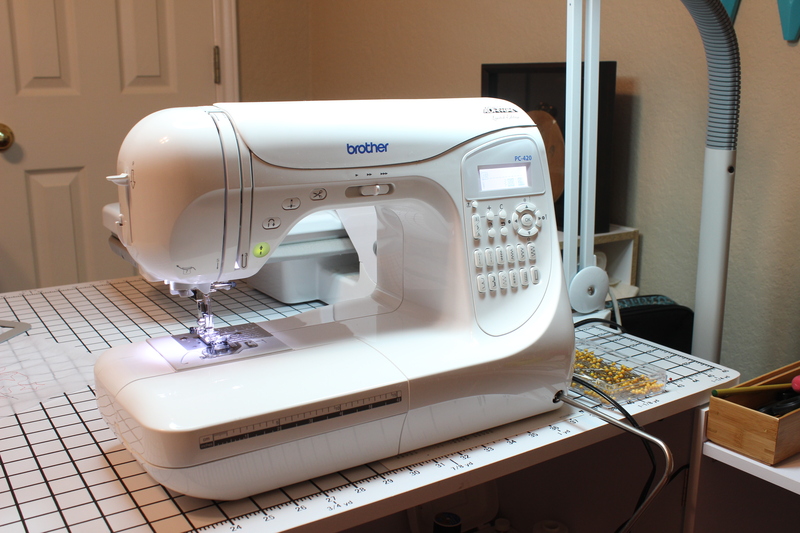 It is a conversion machine that swaps between sewing and embroidery that proved extremely useful when my primary sewing machine, the PC 420, went in for service. I love the huge hoop sizes and she is an exceptional machine. The screen commands are basically the same as my previous Brother machine (again, the same company) but there’s a lot more bells and whistles to this one like the auto-threader and cutting the jump threads. Love that! Would I love a laser too? Sure. Am I going to pay for that (at this time)? No. 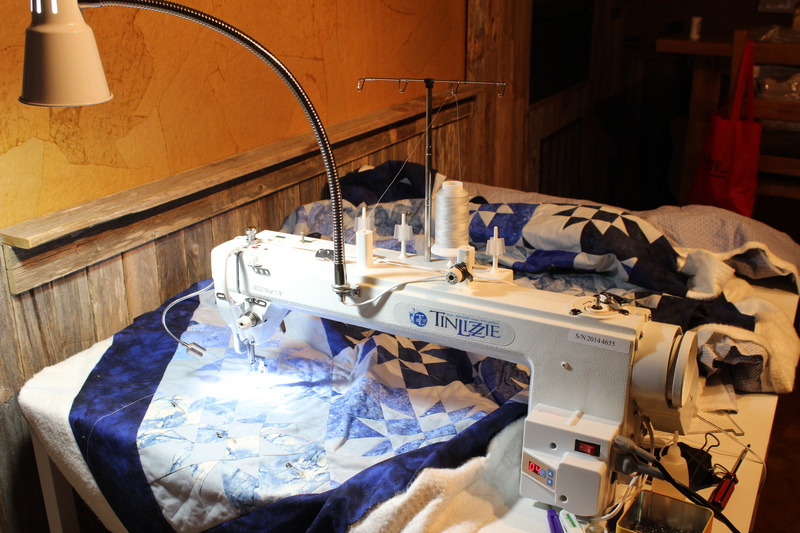 When I went to my first International Quilt Fest in Houston in 2014, I fell for a sit down machine and bought the Tin Lizzie 18 Sit Down on impulse from the SewingMachinesPlus.com booth! My first draw to this machine (aside from the fact that I’m cheap thrifty) was because I was totally unaware of the sit-down concept except for the HQ Sweet 16 that is $5k. Now…wait…I know what you’re thinking. “I know somebody, who has a friend, who’s sister-in-law has one, and she hates it.” I’ll tell you what…and this is First Hand, this machine is THE BOMB! It’s the TinLizzie 18″ Sit Down and she sews like a dream. Everyone I tell about her makes a face. Seriously! They pinch up their face (it’s gonna stick like that) and say something negative. Now I want to know how this company stays in business since forever with a crappy product? In fact, my recently-retired Brother technician said his wife had a TinLizzie for 12 years before they gave it to their daughter and he said it was a pretty good machine. That’s high praise coming from him. I’ve never had a single issue with this baby girl. It does the same job as others in her class and performs without issue. She has a larger 6′ table that folds in the middle for easy storage as opposed to the 3′ table on the APQS George. Do you see that 9 foot quilt for my son taking up that table? She has the auto-needle up/down feature, a variable speed control, a great lamp, builds a bobbin with auto-stop while sewing, and I can oil her without having to perform any auto-mechanics or gymnastic skills. You cannot add stitch regulation to this machine but I’m OK with that. Part of me wanted to learn speed-control-to-fabric-movement first. I have a type of sickness that likes learning things the old way. 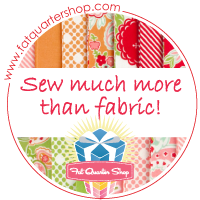 I truly believe it will make me a better quilter. Now, that’s really pretty funny coming from a geek. I mostly use this machine for small quilts and straight line stitching to tack down applique. Janome 900 CPX Cover Stitch Pro. I loved this machine right out of the box. It creates a beautiful two thread stitch on the top and pretty finishing stitch on the back. The machine is quiet and smooth and performs flawlessly. I love to sew knits and I see lots of shorts, tanks, and swimsuits from this pretty girl. I’ll admit I had considered the Brother cover stitch machine, but the sales lady at Sewing Machines Plus recommended this one instead (same price) and said I’d like it better. She’s never failed me in the past so I took her advice. I blogged more info here. My Long Arm. I decided to indulge in a long arm because I’ve got about a dozen quilt tops waiting for the treatment and in case you haven’t figured it out, I’m thrifty. At a minimum of $150 each to finish, that’s quite an outflow of cash so there they sit. In Nov 16, about the same time as the Houston Quilt Show, SewingMachinesPlus.com put a package deal on sale: Grace GQ Frame, Overhead Lights, King Quilter Special Edition, and the Quilt Butler all for less than $14k for 0% interest for 4 years, tax free and free shipping. Stupid not to, right? The King Quilter is a Tin Lizzie so I’m good with that. While initially the investment is to pay for my own quilt top completions, I truly want to long arm for other people when I retire-retire, which is in about 4-5 years. I figure by then I’ll have the kinks worked out of it and my skills will be where I’m comfortable doing this for money. Since my freehanding stinks, the Butler was a must. I love it. We had some initial issues I fully blogged about – you can search if you want to, but now I’m very happy with the purchase. SMP and QuiltEZ, who makes the Butler, have many videos and webinars on YouTube for training and so far-so good. My sweet husband enclosed our back patio for me with new windows and doors and turned that unused space into my quilting studio. Isn’t he a gem? Hi Rebekah (great name! 😉 The machine you buy depends on what you want to do with it. Some machines have features for quilters (straight stitch only with a 1/4″ foot and reverse or a walking foot built in) and some are geared more toward garment sewing with tons of stitch options, button hole & zipper feet, etc. My Brother PC420 has features that support both quilting and garments pretty well. You can also buy a machine that is a crossover that garment sews and also does machine embroidery. I’ve seen Brother machines like that reasonably priced under $800 or so. I shy away from European machines like the Huskvarna (sp?) because the bobbins it uses are difficult to find in my area. And while I love to test drive machines at my local dealer, the price they charge is steep to me. However, their price usually includes lessons and maybe a trip or two to the service dept. I don’t need the lessons so it’s not worth the extra cost to me, but it might be to you. I recommend you test drive some, if you can, to see what you like. Another cost saver is to buy online at a dealer out of state to save state sales taxes and get free shipping. Your local quilt shop will usually have a repair guy that comes by every week to service machines regardless of the brand or if not, those ladies know who to use. To me, Singer isn’t what it once was, I won’t buy a Spiegel because the company filed bankruptcy awhile back, and the cost of a Baby Lock can be significantly reduced by buying a Brother (same company with different labels). 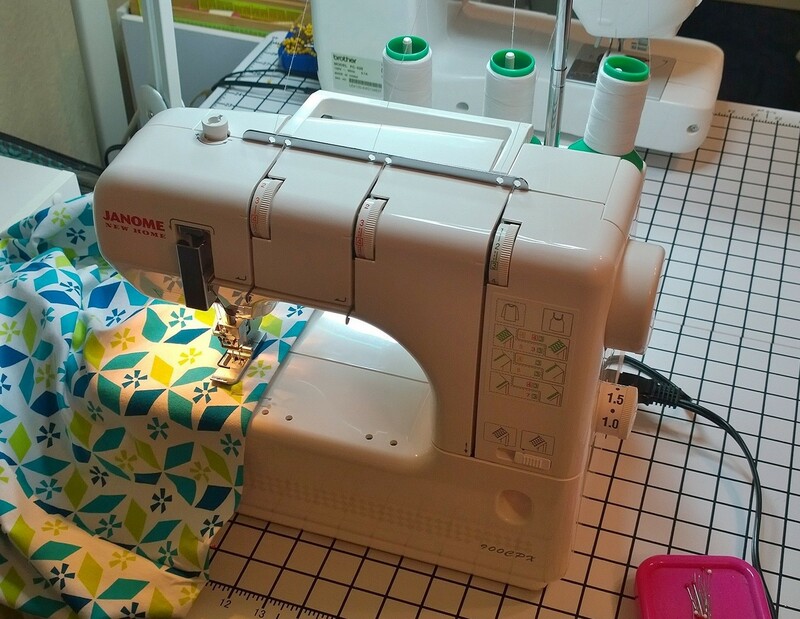 Here’s a good review of a Janome and I recommend it too if the cost fits your budget. https://lladybird.com/2016/12/19/review-the-janome-amh-m100-sewing-machine/ Lots of info but I hope this helps. Good luck! I’m thoroughly enjoying your YT channel and now your blog. Much info I can learn from. I have a way too old Janome MC9000 that keeps blowing a fuse. I’d like to switch from embroidery cartridges to digital files anyway to have more design options. Im a little geek. Lol. Whats your opinion on machines and software i can get? Id like separate sewing, embroidering machines. Thanks much. Love your you tube channel. I’ve had a White serger for years that I never could get the stitches right. I just figured it wasn’t expensive so it must be lousy! The lady in the sewing machine store showed me a $3,000 serger! Told me it was great. I’m sure it was but that makes my tee shirts awfully expensive! After you talked about your $199 serger I took mine out again. I got it to work nicely. So I want to say thanks for being realistic about sewing. I appreciate all your tips.